Merry & Bright at Purple Onion Designs (video)! 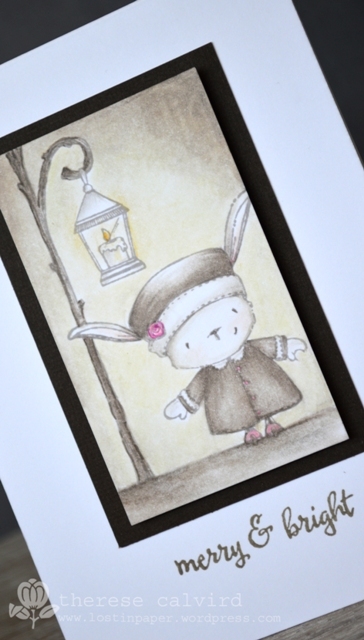 I’m still playing with A Charming Winter, the fabulous new release from Purple Onion Designs and Stacey Yacula. I decided to make my card ‘merry & (not so) bright’, I thought the little hot pink flower could be the ‘bright’ on it’s own. Other Supplies: Prismacolor Pencils – Cream, Yellow Ochre, Light Peach, French Grey 20,50,70%, Ginger Root, Warm Grey 20%, Cool Grey 70%, Process Red, Pink, Sepia. Tack n Peel. 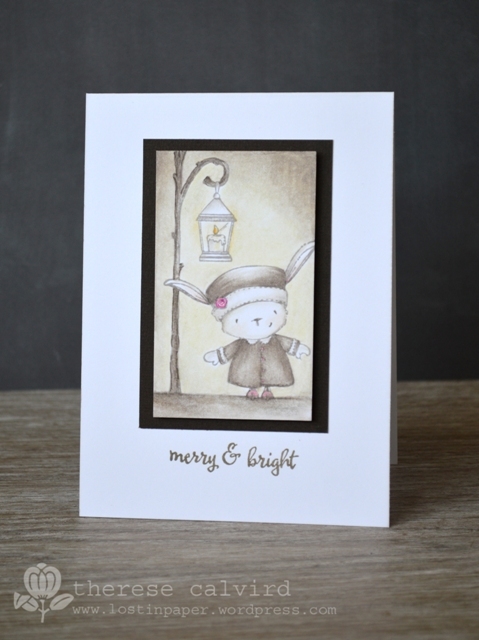 < Previous Happily Stamping for Christmas with Mama Elephant (video)! Next > Addicted to Die Cutting my big finale (video)! So cute! You did a fabulous job with the coloring! Honestly Linda, these are the absolute easiest of mediums to use! I adore my Prismas and lately they have definitely become my ‘go to’ for colouring. I also have some Faber Castel Polychromos that you can compare (although similar these are oil based), and I have my left eye on the Spectrum Noirs… just pondering if I really ‘need’ them though lol. You are more than welcome to come round and try them out if you want, I’ll put the kettle on! This is so lovely, Therese! I just love the sepia theme! I should try this idea sometime! Such fun images and another wonderful card Therese! This is such and adorable card! Love your coloring, no matter the medium. This release is so fun – just love all these little creatures! I love watching you color with pencils! Especially to that music-lol I love the colors you’ve chosen, it’s so lovely:) Thank you for sharing your talent with us. It’s very inspiring! I bought my Prismas because of you lol!!! Your coloring is amazing! I bought myself Prisma color pencils and I have to say that I love them too, but now I think I need some more colors. I have spectrum noir markers as well, and I don’t feel that I can blend them that well when I’m coloring, so now I have been thinking about Copics … But I really don’t know if they are better to color with? Your coloring is gorgeous , Therese! This is a beautiful vintage card. Wow Therese! This is a mini masterpiece! Love everything about it. Simply adorable! Your Prisma coloring is always perfect and you make it look so easy. Thank you for sharing your lovely creations. So sweet! I love how you colored the scene with your Prima pencils!! Adorable! Love the sepia, vintage photo feel of this with the little pops of pink. Your shading around the lamp light is especially gorgeous. Oh my dorable! I really love the pops of pink, goes with the sentiment so perfectly!